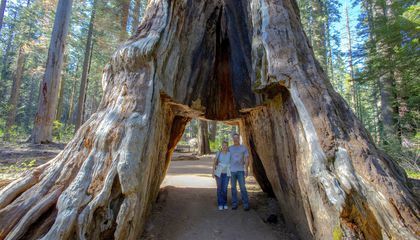 A tunnel was carved into the tree's trunk in the 1880s to allow tourists to pass through. It weakened the giant. The tunnel had allowed cars to pass. But only pedestrians could cross in recent decades. Generations of locals and tourists have visited the tree. They posed for photos and carved their names into it. After it fell, many took to social media, posting their memories of the tree. "It's kind of like someone in the family has died," said Joyce Brown. She is a 65-year-old retired middle school teacher who has been visiting the tree since she was 12 and owns a cabin in nearby Arnold. Brown said four generations of her family spent numerous hours at the tree and often took out-of-town visitors there. Some of those visitors came from as far away as Turkey. 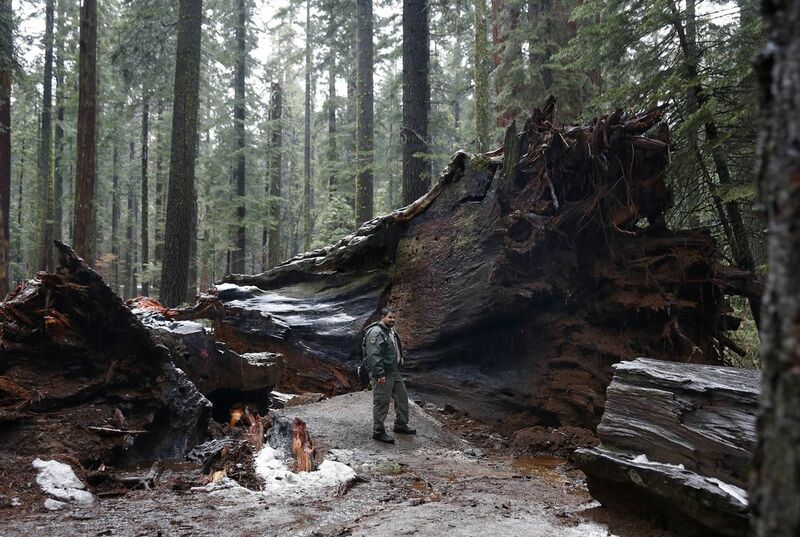 He was stunned by the sequoia's size. When his family of four tried to join hands around the tree they discovered they couldn't even come close. "It was so different and so odd," said Crawford. He grew up on a farm in Virginia and now lives in Charleston, South Carolina. He recently visited the tree again, reliving those memories. I believe that a car could fit through a tree because some tree cutters have changed the tree so that there Is a tunnel for people to go through which I personally think is very cool for tourists. They could were able to make a tunnel (modify) it because the tree was recently taken down by a storm. In the text, it says,"A tunnel was carved in the tree's trunk". The text also says,"A massive storm toppled over the tree". They carved a hole in the giant tree so we could drive thru it. It is like a underpass I go thru to get to the dentist. The car could fit through the tree because they probably took the biggest car and the cut the hole. They would carve through until the car is able to get through. What would they carve a hole in to and what tool did they use? I think that they measured a car and then measured the tree to see how big the hole was going to be for the cars. I agree with you i think that they measured a car and used the car to make a hole so that cars could pass through. I agree with you, because if they didn't measure, the hole would be too big or too small for a car to fit in. What do you mean by the biggest car also how did they cut the hole in the tree? They make space for a car to be able to fit and the tree is big enough to make it fit.